It was a tough start to the week for many air travelers as federal budget cuts led to cascading delays along the East Coast Monday morning. Some flights out of New York and Washington were delayed by more than two hours as the Federal Aviation Administration kept planes on the ground. The federal agency has said furloughs of air traffic controllers could lead to delays if there weren’t enough people to monitor busy air corridors. For instance, the 8 a.m. US Airways shuttle pushed back from the gate at Reagan National Airport six minutes early but didn’t take off until 9:58 a.m. The plane landed at 10:48 a.m. — more than two and a half hours later than its scheduled time. If travelers instead took Amtrak’s 8 a.m. Acela Express train from Washington, they arrived in New York at 10:42 a.m. — 4 minutes early. Government budget cuts that kicked in last month are forcing the FAA and other agencies to cut their spending. FAA officials have said they have no choice but to furlough all 47,000 agency employees, including nearly 15,000 controllers. Each employee will lose one day of work every other week. The FAA has said that planes will have to take off and land less frequently, so as not to overload the remaining controllers on duty. Skies were mostly calm along the East Coast, with the exception of a few wind gusts in New York. The delays seen were much more severe than what would normally be seen on a comparable day with full staffing. Delta Air Lines said it was “disappointed” in the furloughs and warned travelers Monday to expect delays in the following cities: New York, Philadelphia, Fort Lauderdale, Fla., Chicago, San Francisco, Los Angeles and San Diego. The flight tracking service FlightAware says flights heading to Florida are seeing delays of up to an hour. Raymond Adams, president of the air traffic controllers union at New Jersey’s Newark airport, said on Twitter than a few flights out of Newark to the south got sent back to Newark because the Washington area air traffic control system was overwhelmed. Some groups are warning that the slowdown could hurt the economy. Numbers are down at the American International School in Bamako, the capital of Mali. Teacher Paul Chandler is taking his combined class of 6th- and 7th-graders through their early paces, learning the Malian music they’ll be performing at the annual school concert. 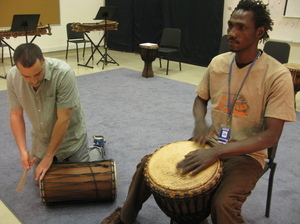 Teacher Paul Chandler (left) and musician Siaka Doumbia play djembe drums during music class. Fousseiny Diallo, 14, has been studying with Chandler for three years. Chandler says the wealth of Malian culture makes it a real pleasure to teach his young students. He invites professional Malian musicians — guitarist, arranger and composer Lamine Soumano and drummer Siaka Doumbia — into the classroom to help with lessons. With the current problems that have shaken Mali to its roots, Chandler says, the idea of mixing the music has added poignancy. It’s been a decade since Minnesota-born Chandler, who was raised in Nebraska, left the U.S. and headed to Mali to study music.